Stephen “Sam” Hood has devoted a book to footnotes. Now before you dismiss it out of hand, footnotes in history, as in law, are very important. I had a case before the U.S. Court of Appeals for the Second Circuit when I was 28 years old. The U.S. Attorney cast doubt on a statement I made about an event in El Salvador by saying that the two cities in question were too close together for my scenario to be true. His footnote cited a National Geographic map. I got the map out and laughed when I saw that it was a map of the entire Western Hemisphere. Cities that looked right next door on that map were actually scores of miles away from each other. 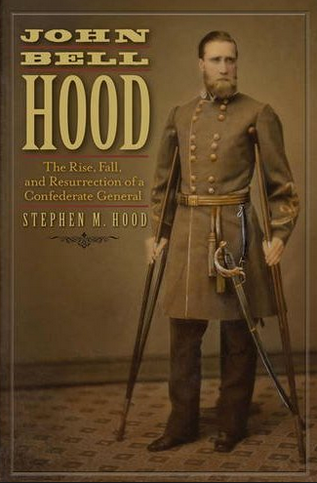 Sam Hood’s new book claims that a number of books published in the 20th Century have made serious errors about his cousin John Bell Hood, the commander of the Confederate Army of Tennessee in 1864. Since I began researching The Immigrants’ Civil War in 2010, I have noticed some of the same problems with Civil War historians’ writings that Sam Hood identifies. Sam Hood correctly states that many of the claims made by historians about the Civil War general are based on information sourced in footnotes to books that do not substantiate the claims made. I have found the same problems in my own research on immigrants in the war. For example, a well known Civil War author wrote that a certain immigrant leader was drunk at a particular battle. I looked at his footnote and found no eyewitness source for this claim in either the primary or secondary literature. Hood also says that once an historian makes an error, other subsequent historians copy that error without doing original research that would quickly debunk it. The later historians do not always even cite the previous historian who is the source of the error, but they often merely copy the alleged primary source from the progenitor of the error. The unacknowledged reliance on secondary sources by historians is much wider spread than just among Hood writers. I have made great use of the letters of Peter Welsh of the Irish Brigade. The same quote from Welsh keeps turning up in the works of some major historians. The historians invariably cite to his letters, but since Welsh says similar things several times in slightly different words in various letters, it would seem odd if each historian came up with the same quote independently. Obviously they are getting the quote from one another and are offering it up without attribution as though they had come up with it themselves through their own close textual reading. Sam Hood also alledges that either through personal bias or to create a more marketable narrative, several historians created a “Hood as Villain” myth, presented it as history, and that it was unquestioningly copied by others. He provides some good documentation of this charge. When I purchased this book, I was worried that it would be little more than an exercise in hagiography by a relative of a Civil War general. Hagiography originally meant a life of a saint. The title enhanced my fears. Subtitling a book “The Rise, Fall and Resurrection of a Confederate General” gives it a messianic feel. Don’t worry, though, Sam Hood does not “resurrect” his cousin, he just dusts off the corpse a little. The book functions as brief against several historians, led by Wiley Sword, and not as a counter-biography. There are several problems with this book, however. First is, if you haven’t really cared much about John Bell Hood, you won’t care much about him after you read it. Even if we accept all of Sam Hood’s claims as true, General Hood was still a young man who was not capable of turning around the Confederacy’s fortunes in Tennessee. The second problem is that Sam Hood makes some dubious claims of his own and he tries to arouse irrational and unsupported prejudices against the men he takes on. Sam Hood sometimes seems in such a rage against his opponents that he uses weapons against them that can be turned on himself. David Eicher is the author of an annotated bibliography of books on the Civil War. Sam Hood slams Eicher, who cautions in his The Civil War in Books that the General’s memoir is distorted and rewrites history to defend his own reputation. In Sam Hood’s attack on Eicher he describes him dismissively as “a chemistry teacher who also writes on astronomical matters.” I note that Hood himself is not a professional historian (nor am I). He appears to be a Civil War buff in the construction business. While this is Sam Hood’s first book on the Civil War, Eicher is the author of eight books on the Civil War. The Civil War in Books is published by the respected University of Illinois Press. His other books are published by Stanford University Press, Little Brown, and Simon and Schuster. If Eicher is inadequately credentialed, then Sam Hood is infinitely less so. And when Hood describes Eicher as the author of “several” Civil War histories, the reader is left with a misleading impression of the nuber of works Eicher has written. Sam Hood also needlessly distorts elements of the record. For example, responding to the claim that Hood did not do well while studying at West Point, Sam Hood writes that “Hood graduated…in the bottom third of his class (44th out of 52).” At my school, we called that graduating in the bottom fifth of our class, or eight spaces from last. [Kindle Loc 5642] Sam Hood compounds the deception by saying that John Bell Hood should really be considered 44th out of the 200 students who applied to West Point. What an odd claim. I graduated 27th out of 260 students in my law school class. Should that really be 27th out of the 700 candidates who tried to get into Hofstra my first year? After trying to convince us that Hood did a lot better at West Point than we think he did, the author then argues that doing well at West Point didn’t mean much anyway. [Kindle Loc. 5650] Then, again without saying so directly, the author implies that Hood may have been of such genius that he did not exert himself until final exams time, and then did just enough to pass. I’m not sure if the image of Hood as underachieving slacker is one the author meant to convey. Sam Hood also descends into minutiae at times. Incredibly, he gets caught up in arguing with several historians about whether Hood was good looking or not. He quotes a contemporary who describes Hood’s “yellow waving hair” and “Herculean frame” in fanboy superlatives. I have circulated Hood’s picture to a number of non-Civil War buff heterosexual female friends and on the “Hot or Not” scale he gets more nots than hots, although a few describe him as having a certain bad-boy look that draws them in. The bad news for Sam Hood is that there was a reason all those Civil War Era women turned him down, and it wasn’t because of his problems with flank attacks. Overall, if you are really interested in John Bell Hood and you like the “history as controversy” approach, this is an engaging book that you will find entertaining. Otherwise, spend your money on a book like The River of Dark Dreams which deals with a more consequential controversy, the place of mid-19th Century slavery in the transnational capitalist economy. Thanks for taking the time to read my book, and for feeling it worthy of a review. I respect both your praise and criticism, and would like to reply to a few of your observations. The very first words in my book are: “It’s a shame a book like this even has to be written.” I then explain that my book is not unbalanced, rather it is itself the balance absent in other books on Hood’s campaigns and battles in the West. I implore my readers not to just read my book, but to also read those that I criticize in order to get a complete view of a very complex and enigmatic man–John Bell Hood. As for the specific examples of some of my arguments that you criticize, I understand and appreciate that yours is a review and not a monograph, so you can’t bury your readers in detail. But you did much the same as what you criticize me for doing–taking some subjects out of context. I explain in my Introduction that the earliest writers who were highly critical of Hood were from Tennessee–the site of the Army of Tennessee’s final (lost) battle. I state up front that it could be coincidence, but the writers did in fact have strong Tennessee connections. You mention my criticism of David Eicher, but tell your readers only that my footnote describes him as a chemistry teacher. He is, and I did. But you did not inform your readers of the very substance of my criticism of Eicher–that he made outrageous and totally unfounded (by any measurement) claims against Hood, and when I submitted multiple requests to him for detail or proof, Eicher would not even reply. You also seem unimpressed with the information I provide my readers on Hood’s academic and conduct record at West Point. All I was doing was adding context to his class ranking and his demerit record. I graduated from Kentucky Military Institute in 1970 and finished around the middle of a class of 50 cadets. There were a dozen or so members of my class who, during the year, were expelled or gave up and went home. I certainly feel like I finished ahead of them, and don’t think that is unreasonable. I can also personally attest to the difficulty of going a single day in a military academy without a demerit, much less a full semester as Hood did. In my book I simply gave more information, not less, and let my readers draw their own conclusions as to whether Hood was the knucklehead that many authors claim. You also either missed the context of my brief discussion on whether Hood was good looking or not, or for some reason you don’t include the full context it in your review. In my book, while on the subject of the extent to which some authors (most notably Wiley Sword) desire to insult Hood, I gave–only as an example–Hood’s physical appearance. I qualified the subject by writing, “Although in and of itself unimportant, Sword’s physical description of Hood revealed a strong bias.” Yet you state in your review that “Incredibly, he (me) gets caught up in arguing with several historians about whether Hood was good looking or not.” Whether or not Hood was good looking is unimportant to any mature reader, and I wasn’t trying to convince anyone that he was. I clearly used the example of the description of his physical appearance as one of many examples of the literary bias that permeates many modern books. Context is everything in non-fiction literature, as it is in law. (I am not a lawyer but I’ve used a hundred of them.) An author—like a lawyer with a jury—can sway a reader to draw an incorrect inference by giving facts, but only selected facts, and expressed in a certain way. This I argue is what many modern authors have done with John Bell Hood, and, I suspect, other historical characters. Thanks again for the respectful review. Hi, I came here from kevin levin’s blog to see what you would have to say about the John Bell Hood book. And you didn’t let me down, I knew if you were a fan of levin’s then you would have the same axe to grind, You didn’t disappoint; Your liberal progressive South bashing came through in your last line when you said; “Otherwise, spend your money on a book like The River of Dark Dreams which deals with a more consequential controversy, the place of mid-19th Century slavery in the transnational capitalist economy”. Thank you Sam Hood for you reply and especially the last line: “This I argue is what many modern authors have done with John Bell Hood, and, I suspect, other historical characters.” Applies especially to the South.